4 Bedroom Terraced House For Sale in Bushey, Hertfordshire for Offers in the region of £785,000. Ready For Occupancy - Make An Appointment To View Today. 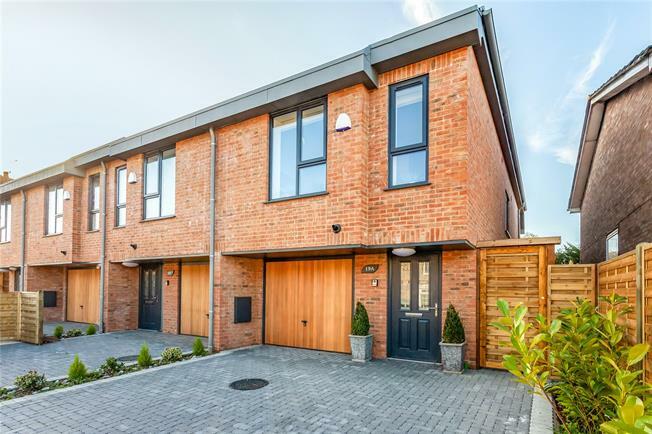 A select development of just four 3 & 4-Bedroom family homes situated centrally in Bushey Heath and conveniently located for its range of independent shops, eateries, open spaces, excellent schools and rail links to central London via Bushey station. Each home has spacious living space to include a fully integrated Kitchen, Utility Room, Lounge, Guest Cloakroom, contemporary Bathrooms , flooring throughout and Garage plus off-street parking. - Kitchen and Utility Room with stylish handleless units, marble work surfaces and upstands. Siemens integrated appliances to include 4-ring induction hob with floating overhead feature extractor, fan assisted electric oven and microwave combination oven, dishwasher, fridge/freezer, washing machine/self-condensing dryer and wine chiller. - Contemporary Bathroom and Ensuites with porcelain floor tiles and part wall tiles. High gloss vanity unit under wash hand basin. Wall hung concealed cistern wc, panelled enclosed bath with concealed LED lighting. Hansgrohe thermostatically controlled shower with separate handheld shower. Hansgrohe mono bloc mixer taps throughout. Tempered glass shower screen to family Bathroom and Master Ensuite. Illuminated LED mirrors. Heated chrome towel rail. - Study to select houses. - Large porcelain floor tiles throughout on Ground Floor. Soft Grey carpet to stairs, landings and Bedrooms. - Under floor heating to Ground floor, Bathrooms and Ensuites. Gas fired central heating with radiators to First and Second Floors. - Double fitted wardrobes to all Bedrooms. - Built-in speaker system to Reception, Kitchen and Master Bedroom. - Alarm and video entry systems. - Brushed stainless steel inset spotlights to various rooms and walkways. Wall lights to First and Second Floors. Contemporary wall lights to Bedrooms 1 & 2. Sensor lighting to fitted wardrobes in Bedrooms 1 & 2. Outside lighting to front and rear. - Outside tap to rear exterior. - Sandstone patio and South West facing rear 70 foot garden. - Integral Garage with Oak hardwood door and power. From Windmill Street, Bushey Heaths High Road is less than a 10 minute walk or 5 minutes by car where you will find a Tesco express, a delicatessen, artisan bakery and a good selection of upmarket independently owned stores as well as a superb choice of quality restaurants and country pubs. Bushey Heath is a thriving community in its own right, with a strong sense of community and ideally situated for easy access to North West London. Always popular amongst families wanting to settle in this leafy green suburb with some of Hertfordshire’s most well regarded state and independent schools, two of which are Emmanuel College and Bushey Heath, both less than half a mile from your doorstep. The King George recreation ground is one of the area’s best loved green flag awarded open spaces and offers a variety of leisure activities as well as seasonal festivities including funfairs, teddy bears picnic, dog shows and Easter egg hunts as well as music and much more. Hartsbourne Country club is just over a mile away and offers members 27 individually challenging holes set in 180 acres of beautifully manicured and mature parkland and is considered the hidden gems of private members golf. Junction 5 of the M1 is under 3 miles away with easy access heading north to the M25 or south to connect with the A41 towards London. Stanmore is also under 10 minutes away by car and allows access by Tube to central London & the city via the Jubilee line.